Of course we’re pretty pleased to be powering Time’s 2014 Person of the Year Poll. Turns out Time’s readers are liking it too. b) interested in other people’s opinions. 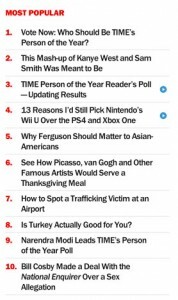 Person of the Year-related stories are making up three of the top ten stories on Time.com right now. The “Face-Off” and “Yes/No” polls on Time.com’s site. 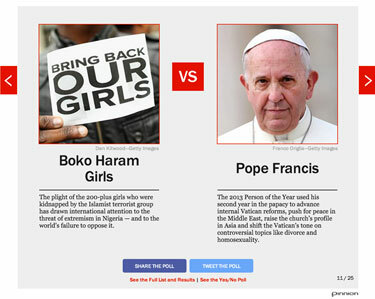 Facebook and Twitter sharing of both the poll itself and visitor’s individual voting choices on the site. Facebook and Twitter authentication for voting. Support branding and design that matches client needs perfectly. We believe that our software should be used to present our client’s brands, not ours. Integration with Twitter and Facebook for both vote result sharing and voting. A seamless experience from desktop to tablet to smart phone. Real-time results aggregated from all voting sources. Do you want to know more about how Pinnion Editorial Services can help increase visitor engagement and traffic for your site? Contact us today.